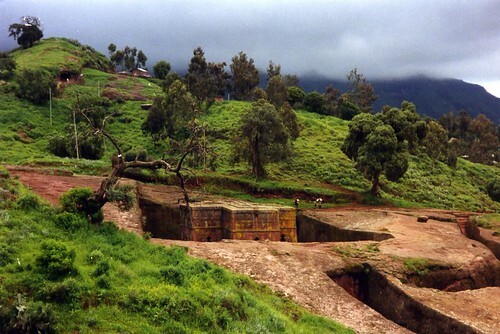 Lalibela a small town in Ethiopia has a unique distinction of having eleven monolithic rock cut churches all of which are carved out of rock and have roofs level with the ground. Remarkably these churches were arduously hewn out of solid rock by first creating a wide and deep trench on all four sides of the rock, then meticulously sculpting the church by chiselling out the interior. It is mind boggling to imagine such formations using just hammer and chisel. 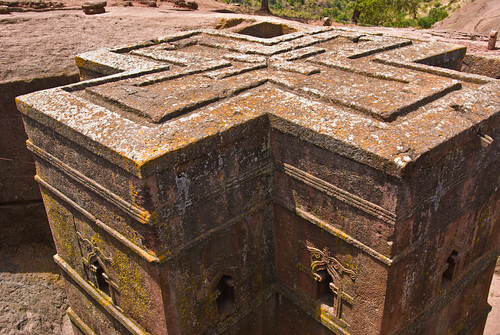 The churches were made in early 13th century by saintly king Gebre Mesqel Lalibela who had a vision to create a "Second Jerusalem". The town was earlier known as Roha but at some later date was given the same name as the saint king. 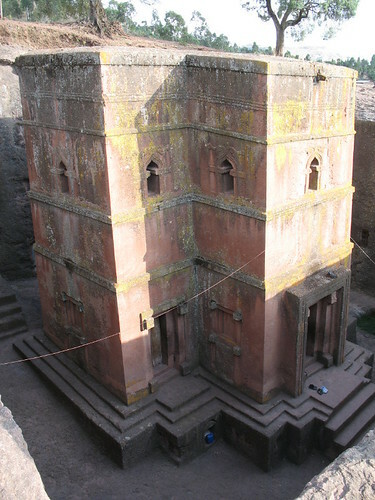 Amongst the 11 churches, the Church of St. George (Bet Giorgis) (pictured below) is the most famous and awe-inspiring. It is last of the eleven churches and was built after the death of the saint king. Its roof, which is level with the ground, forms a perfect Greek Cross. The church measures 25 meters by 25 meters by 30 meters and has been carved out of a single block of granite rock. 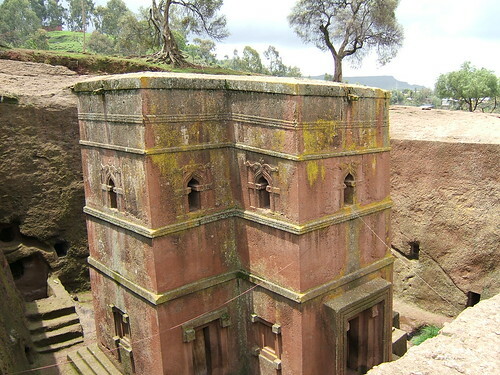 This church along with the 10 others are important pilgrimage sites of Ethiopian Orthodox Church and have also been declared a UNESCO World Heritage Site. Image from Flickr is by mk B.